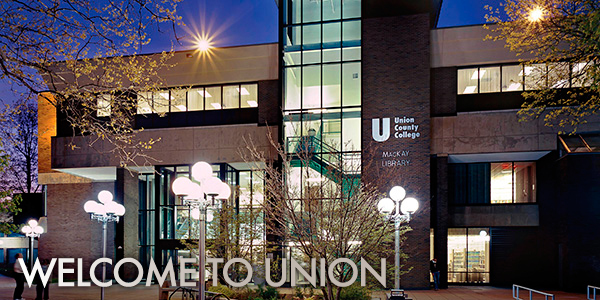 Union County College is a public comprehensive community college. It is the oldest of New Jersey’s 19 Associate Degree Colleges. 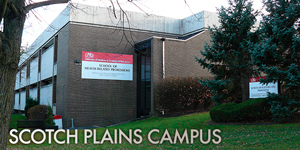 The College operates major campuses in Cranford, Elizabeth, Plainfield, and Scotch Plains. It enrolls almost 30,000 credit, non-credit, and continuing education students and is accredited by the Middle States Commission on Higher Education. Many programs lead to the Associate in Arts and the Associate in Science degrees. Students who satisfactorily complete these two-year programs may transfer to four-year institutions for their junior and senior years. Other programs lead to the Associate in Applied Science degree, the Certificate or the Certificate of Achievement, after which students may choose to conclude their formal education and seek employment in their fields of study. Union County College confers the Associate in Science degree upon graduates of Trinitas School of Nursing, Elizabeth, N.J., and JFK Medical Center Muhlenberg Harold B. and Dorothy A. Snyder Schools, Plainfield, N.J.
Union County College has a remarkable history as New Jersey’s first community college. The College has lived three separate lives since its birth in 1933 as a one-room night school in a Union County high school. Over the past eight decades, the College that was known by such names as Union County Junior College, Union Junior College, and Union College is now Union County College, a comprehensive community college serving 12,000 credit and 10,000 non-credit students at three campuses in Union County, New Jersey. U.S. President Franklin D. Roosevelt founded Union County Junior College as an “emergency junior college” through the federal Works Project Administration. The College’s original mission was to provide jobs for unemployed teachers and professors. By 1936, the College became Union Junior College as an independent, non-profit, degree-offering institution governed by a Board of Trustees. The College’s mission was to prepare students for transfer to earn bachelor’s degrees. In 1982, the County-funded Union County Technical Institute merged with what was now a 50-year-old junior college (Union College) to become the Union County College we know today. The merger included the establishment of a Board of Trustees to oversee College operations as well as a separate Board of Governors to play an advisory role and assist in the appointment of Trustees. With the merger of the Technical Institute with the extant junior college, Union County College adopted the multi-tiered mission of an open-access, comprehensive community college. As such, the College has over 60 associate degree and certificate programs, as well as noncredit opportunities for continuing education and workforce development. The College is committed to its “open door” mission as evidenced by its providing developmental education for academically underprepared students. Since Fall 2014, the College has also attracted the County’s brightest students to participate in its American Honors Program, a cohort-based degree program that provides honors students with seamless transfer to the nation’s top universities. 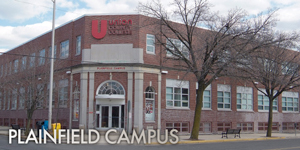 Union County College has campuses in Cranford, Elizabeth, Plainfield, and Scotch Plains. An increasing number of students are also taking classes online. The College offers more than 150 courses through its distance education program. More than half of the College’s students are enrolled on the Cranford Campus’s 47-acre suburban setting. The Elizabeth Campus is located in the heart of New Jersey’s fourth largest city, and more than 40 percent of the College’s students take at least one class in either the Lessner or Kellogg buildings in Elizabeth. The Plainfield Campus, which had been confined to a single City block since opening in 1992, doubled its footprint as a result of the 2013 purchase of property that was once an automotive parts facility. In fall 2015, the Plainfield campus Annex building was completed for the Health Sciences programs. Students in the Practical Nursing, Emergency Health Science, and Paramedic Programs are studying in newly built, state-of-the-art labs. It houses a new information commons, a cafeteria, the Academic Learning Center and the bookstore. In fall 2016, a new two-story, 40,000-square-foot facility has become the hub of the College’s Cranford campus where a wide range of student services are housed. The new Student Services Building is home to the Helen E. Chaney Student Services Center, a one-stop center on the first floor that includes: Registration Services; Bursar and Payment Services; Financial Services; Disability Services; Educational Opportunity Fund Services; Advising, Career and Transfer Services and meeting rooms. The second floor houses an array of computer and multi-use classrooms, math faculty and staff offices, and support facilities. Diagnostic Medical Sonography - (Commission on Accreditation of Allied Health Education Programs with the recommendation of the Joint Review committee on Education in Diagnostic Medical Sonography), conducted jointly with JFK Medical Center Muhlenberg Harold B. and Dorothy A. Snyder Schools. 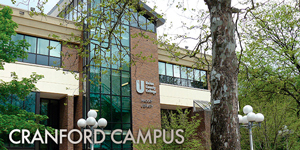 There are nine major buildings on the Cranford Campus at 1033 Springfield Ave, Cranford: Kenneth Campbell McKay Library, Academic Learning Center, and the Center for Visual Arts and Communication; the Humanities, Science, and Nomahegan Buildings with classrooms, lecture halls, seminar rooms, science and computer laboratories, and faculty offices, lounges, cafeteria and faculty dining room; the NEW Student Development Building contains lecture and computer classrooms, faculty offices, and the Student Services Center offering One-Stop Registration, advising, and support services; the Campus Center with the Roy W. Smith theater, gymnasium, fitness center, Executive Education (teleconferencing) Center, other facilities for student activities, and bookstore; the Victor M. Richel Commons, a student life/student lounge facility featuring an atrium and multilevel floor providing a variety of lounge and meeting spaces; James R. MacDonald Hall, which contains administrative offices; and the William Miller Observatory, which houses a 24-inch reflector and 10-inch refractor telescopes, a lecture room, optical shop, and computer center. The College shares a 40-acre campus in Scotch Plains at 1776 Raritan Road, Scotch Plains with the Union County Vocational Technical Schools and the John H. Stamler Police Academy. Union County College and Rutgers University jointly operate the Regional Health Education Center in the College’s 65,000 sq. 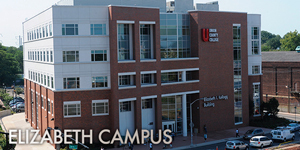 ft. Health Technologies Building, and it has also been designated as the fifth campus of Rutgers University. It provides classrooms, lecture hall, seminar and conference rooms, allied health and science laboratories, library, faculty and administrative offices, dining room and Campus Center. Thanks to the support of our community volunteers, the Foundation funds four student success campaigns that have a dramatic impact on student outcomes.